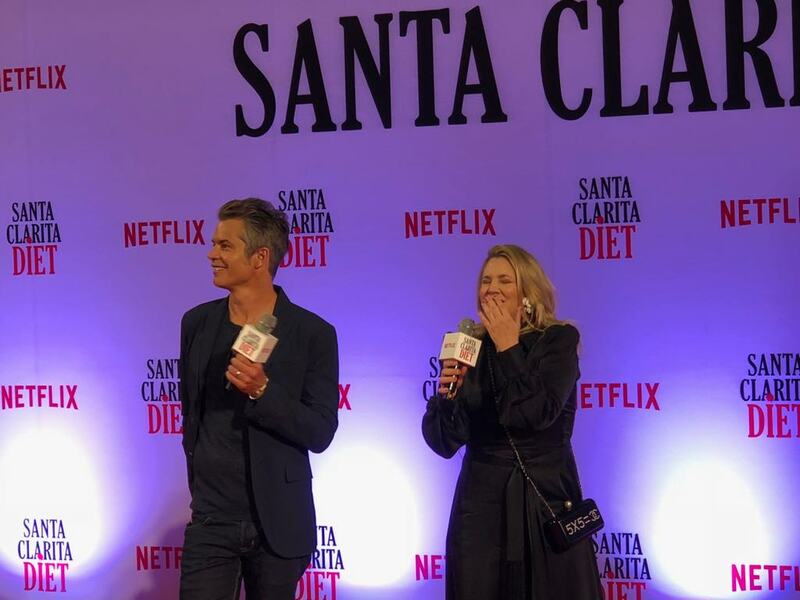 Drew Barrymore and Timothy Olyphant gives the Philippines a taste of the Santa Clarita Diet and it’s bloody delicious! Yesterday, the world (okay, maybe just the people over at SM Megamall Fashion hall atrium) got to witness the stars of the hit Netflix series Santa Clarita Diet in the flesh (pardon the pun)! That’s right folks, Drew Barrymore and Timothy Olyphant paid Manila a visit to promote the up and coming second season of their show Santa Clarita Diet and hey, everyone was all smiles! Santa Clarita Diet is a show about “ordinary husband and wife realtors until she undergoes a dramatic change that sends them down a road of death and destruction. In a good way.”, and by dramatic change we mean that she turns into a flesh eating undead. Pretty gruesome right? Well you see SCD is much more than zombies and undead ala-Walking Dead, you’ll be delighted to find out that it’s a very light hearted show with tons of comedic moments and surprisingly, a lot of values about love and family, who would have thought huh? Barrymore and Olyphant graced the Manila crowd last night to thank the fans for all the support for their show and to let us know that the second season is coming up on March 23 but hey, lucky audience members got to watch the premiere episode for season 2 last night and without spoiling anything, it’s just as awesome as the first, maybe even more! It’s not Drew’s first time here in the Philippines as she was here a couple of years back to promote her company Flower Beauty and hopefully get these amazing products into our store fronts as well. For Timothy, much to everyone’s surprise, he actually LIVED in Davao when he was a small child, citing that a family member used to work for Del Monte and that his Grandfather (or Great Grandfather) was actually the head of the Engineering Department at UP! We’re excited for season 2 and seeing Drew Barrymore and Timothy Olyphant a few meters away from us just got us more hyped for the new episodes! Don’t forget to catch all the gruesome goodness of the Santa Clarita Diet as season 2 premieres on March 23, exclusively on Netflix! Previous articleMassive Haul, Discounts and New Community Activities Revealed during Gaming Library’s 7th Birthday!